The Illinois Department of Public Health has confirmed 97 cases of Salmonella Hvittingfoss infection that has been linked to Subway restaurants in 28 counties in central Illinois. The state is still investigating the cause of the outbreak. In an emailed statement to WalletPop, Subway apologized to its customers for the Salmonella outbreak: "We sincerely apologize to all SUBWAY® customers, those who have fallen ill, and those who now may hesitate to come back for a while. We are truly sorry for the difficulty this situation has caused you, our customer, and are working diligently to solve this mystery and to regain your trust." 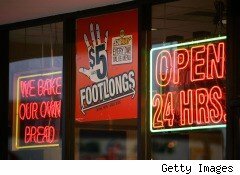 Subway also said it has reinforced its food safety and cleanliness standards, including glove use during food preparation and hand-washing procedures. The rare strain of Salmonella that has been linked to 47 Subway restaurants has sent 26 people to the hospital, but has caused no deaths, state spokeswoman Kelly Jakubek told Reuters. As a precaution, Subway, one of the largest U.S. restaurant chains, removed onion, green peppers, tomatoes and lettuce from its restaurants in early June and replaced the vegetables. All the salmonella poisonings were between May 11 and June 4, the state says. Symptoms of salmonellosis -- the illness caused by salmonella bacteria -- include diarrhea, vomiting, fever and stomach cramps. The sickness lasts between three and seven days. Salmonella is usually spread through contact and one of the ways to combat the spread of the salmonella bacteria is frequent hand-washing. Consumer Ally has been following the outbreak investigation.